Leap Castle is said to be the most haunted castle in Ireland. It has had a horrific history with each passing century being punctuated by ferocious acts of violence. 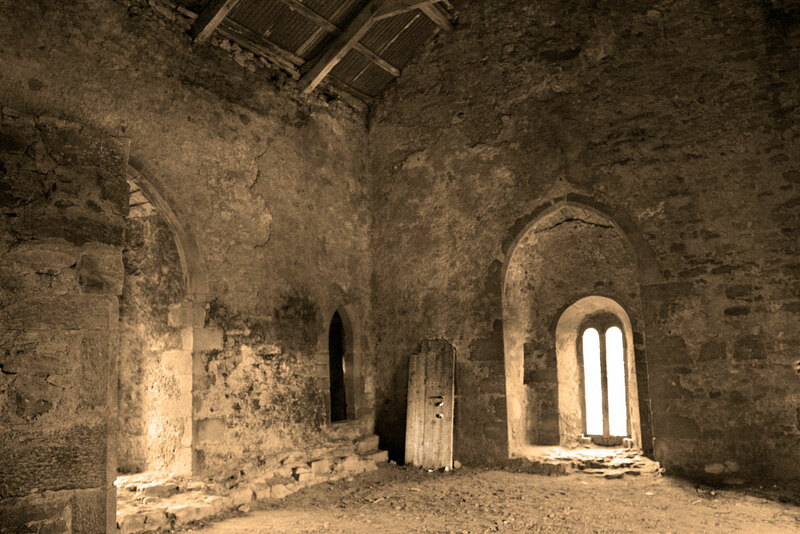 Of one the most gruesome murders to take place in the castle occurred in 1532 in a room above the main hall of the castle which is now know as ‘The Bloody Chapel’ and this is the room featured in this photograph. The original castle is thought to have been built circa 1250 and was the principal seat of the fearsome Ely O’Carroll clan. In the aftermath of the death of the chieftain Mulrooney O’Carroll in 1532 a bitter succession dispute arose over the leadership of the clan. The dispute came to an abrupt end when “one-eyed Teige O’Carroll” who as mass was being celebrated in the room stormed in chanting holy rites and drove a sword into the back of the priest who was also his older brother Thaddeus. The fatally wounded priest fell onto the altar in front of his family and breathed his last. The priest’s spirit is said to haunt the Bloody Chapel and is thought to be one of Leap’s earliest ghosts. Even centuries later when the castle lay in state of ruin, passers-by have seen the window of the room light up suddenly late into the night. In 1922 workmen at Leap Castle ****** found an oubliette in a secret dungeon hidden behind a wall in a corner of the Bloody Chapel (to the right of the alcove in front of the window in the centre of this photograph). When they explored the sinister dark hole further they made a horrific discovery – there were enough human skeletons amassed on top of wooden spikes that it would take 3 cart loads to remove them. Prisoners – or unsuspected guests – of the O'Carrolls would have been dropped down through the hidden trap door above the oubliette where they would have had their lungs punctured by the wooden spikes below. There they would be left to die a horrific death within earshot of their gracious hosts and their merriment below. One of the most infamous killings that took place at Leap Castle was also one of the most treacherous. About 40 members of the northern McMahon clan had been hired by the O’Carrolls to train them in new methods of warfare. The McMahon men attended a feast at the castle in celebration of a victory over a rival clan of the O’Carrolls. However the mercenaries were totally unaware that their ruthless employers had poisoned their food so as to avoid having foot the bill. The ghosts of the McMahon clan are said to haunt Leap Castle to this day. In the 1600s the ownership of Leap Castle passed to the Darby family when the daughter of the O'Carroll chieftain fell in love with an English Captain Darby. Their son Jonathan Darby hid vast treasures in the grounds of the castle during the English Civil War. The two servants who helped him seclude his riches were later murdered to guarantee their silence. Darby was later to be imprisoned for treason and when released years later the turmoil of his time in captivity was such that he was unable to locate his treasure. It is said that the hoard remains undiscovered to this day. It was during the 18th century that Jonathan’s great grandson, also named Jonathan Darby, had the castle remodelled to give it a Gothic appearance. It was one of the Darbys who is believed to have brought the most infamous and evil spirit to Leap Castle. In the early nineteen hundreds the occult was a fashionable pastime for the gentry and Mildred Darby begun dabbling in the black arts in Leap with terrifying results. She is credited with unleashing an Elemental spirit to the castle, a type of primitive ghost that attaches itself to a particular place. It can be malevolent, terrifying and unpredictable. "I was standing in the Gallery looking down at the main floor, when I felt somebody put a hand on my shoulder. The thing was about the size of a sheep. Thin guanting shadowy..., it's face was human, to be more accurate inhuman. Its lust in its eyes which seemed half decomposed in black cavities stared into mine. The horrible smell one hundred times intensified came up into my face, giving me a deadly nausea. It was the smell of a decomposing corpse." Her foray into the black arts awakened this Elemental which made its presence felt within the castle with a ferocious intensity for much of following century. Leap was burnt out and destroyed in 1922 by the IRA while the Darbys were living in England. The castle lay in ruins until it was purchased by the current owners Sean and Anne Ryan in 1991. Sean has restored the castle and was a most gracious host when I called to visit Leap to take these photographs. Sean has frequent sightings of the numerous spirits of Leap but thankfully the Ryan’s have never encountered the Elemental who for now seems to have retreated. Despite some early skirmishes he has found that his family and the resident spirits have been able to coexist quite happily at Leap. After all, in terms of the vast and turbulent history of the castle it is he who is just passing through. Leap Castle is said to be the most haunted castle in Ireland. It has had a horrific history with each passing century being punctuated by ferocious acts of violence. One of the most gruesome murders to take place in the castle occurred in 1532 in a room above the main hall of the castle which is now know as ‘The Bloody Chapel’ and this is the room featured in this photograph. The original castle is thought to have been built circa 1250 and was the principal seat of the fearsome Ely O’Carroll clan. In the aftermath of the death of the chieftain Mulrooney O’Carroll in 1532 a bitter succession dispute arose over the leadership of the clan. The dispute came to an abrupt end when 'one-eyed Teige O’Carroll' who as mass was being celebrated in the room stormed in chanting holy rites and drove a sword into the back of the priest who was also his older brother Thaddeus. The fatally wounded priest fell onto the altar in front of his family and breathed his last. In 1922 workmen at Leap Castle found an oubliette in a secret dungeon hidden behind a wall in a corner of the Bloody Chapel. When they explored the sinister dark hole further they made a horrific discovery – there were enough human skeletons amassed on top of wooden spikes that it would take 3 cart loads to remove them. Prisoners – or unsuspected guests – of the O'Carrolls would have been dropped down through the hidden trap door above the oubliette where they would have had their lungs punctured by the wooden spikes below. There they would be left to die a horrific death within earshot of their gracious hosts and their merriment below.